Chickens love to hop onto a perch. This fondness for perches is instinctive. Chickens are descended from the Asian Jungle Fowl, which roosts on the branches of trees. Perching is as natural to hens as scratching and egg-laying. This might lead you to assume that the ideal perch is in a tree, or at least high off the ground. But while some of the lighter breeds such as Bantams or Leghorns might be able to flap their way to the topmost branches, the average domestic hen is way too big to try. A perch that a bird can hop onto from the ground is perfectly adequate. Make sure that the perch is strong enough to take the weight of your chickens, an average egg laying chicken weighs about 2kg. A bantam would be about 800g-1kg and a large breed could be up to 5kg. Make sure that the perch is long enough, you should allow about 20cm per average sized chicken. Don’t place the perch too high. When you first introduce the perch, place it quite low, maybe 10cm off the ground. The chickens will quickly learn to trust it and then you can raise it so it’s just above their heads. When choosing a place to position your perch try to find a spot in the run that is covered so that the hens can still perch when it’s raining without getting wet. Using a perch in the chicken house. When chickens “come home to roost”, they usually head straight for their favourite spot on the perch. It may not look like the most comfortable way to spend the night, but that perch is every bit as snug and inviting to a hen as your warm, cosy bed is to you. Hens will roost on pretty much anything, from an old ladder to a flat plank of wood. But it’s best to give them something custom made – wide enough with rounded corners, and easily adjustable. As their well-being is at stake – and that impacts your egg supply – it makes sense to buy the best. 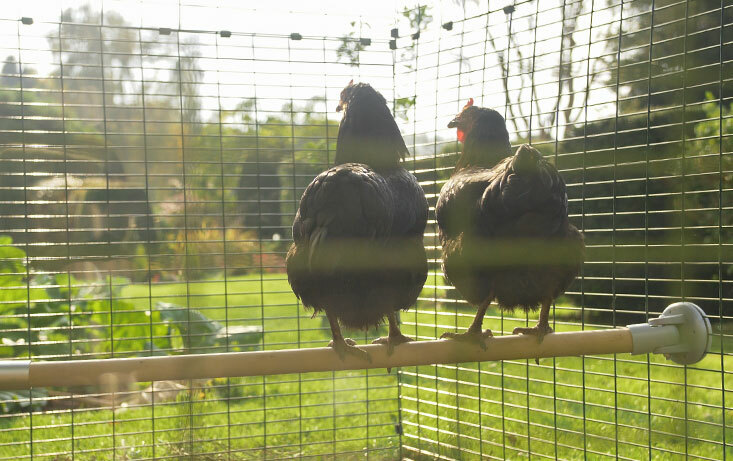 Omlet’s chicken perch is very easy to fit to every type of chicken run and wooden coops too, click here to find out more. If a chicken doesn’t have a perch, they are more likely to attract mites and lice, or to pick up bacteria from the soiled ground. The stress of having no perch will also lower their immune systems, maximising their chances of disease. Perches help hens feel safe and secure. At night a chicken is totally blind, and a perch gives them somewhere to “sit tight” if they are disturbed. As far as they’re concerned, if their feet are gripping that reassuring perch, they’re safe from predators. This reduces stress, which in turn promotes good egg-laying. Perches even help with coop hygiene, as the entire night’s load of droppings will be dumped in one convenient spot for you to clean out.